THE Spanish monarchs have found a high-flying way to get around pesky drones. 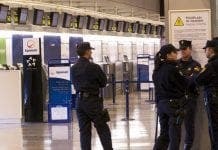 Eagles specially trained to take them out are set to swoop around Madrid’s Zarzuela Palace after unwanted attention from the flying objects last July. 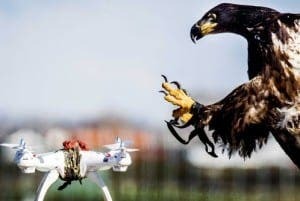 King Felipe VI and his family got the idea from the Dutch police who were the first to train a fleet of drone-catching eagles. Now Spanish bird trainer Jesus Gomez and his eagles are being commissioned by the royal family to protect their privacy. The identity of the person who sent last summer’s drones was never discovered. Previous articleVIDEO: Have you met San Pedro’s resident pig? The correct collective noun is a “congress” of Eagles. You can have a fleet of drones. An ecologically sound solution to air pollution! This method may easily be adapted by the arabs from ISIS in order to prevent their leaders to be killed by US drones. Think you will find the drones you mention, might be a bit too big to be taken out by an eagle Wolfgang. The ones doing the snooping, only need to carry a camera, you could probably disable one of those with a cricket bat. Stefanjo, I agree that the eagles will not be able to eat the US combat drones. But they will be able to blow the drones off from their course as ISIS will use suicide eagles or a squadron of hawks. Love the “suicide jihadi eagles” Wolfgang. Small drones with cameras are being used to control for marijuana as well as planes.